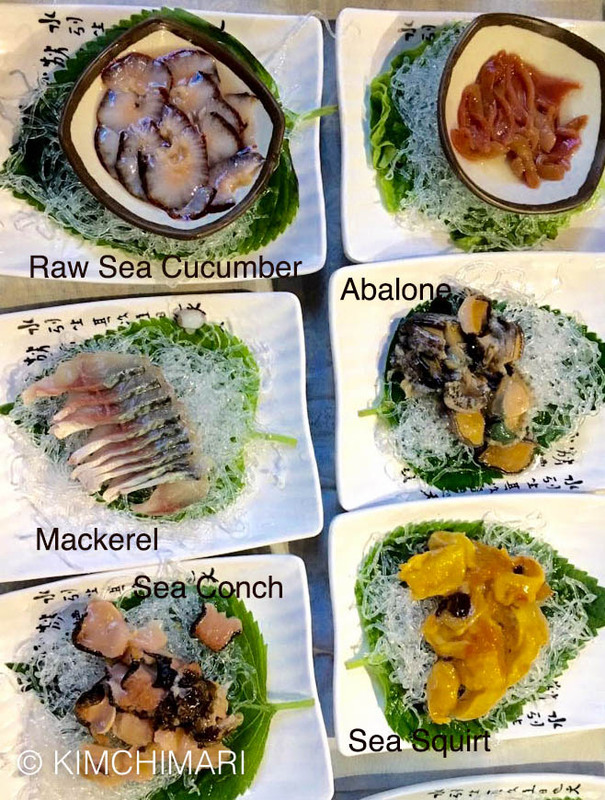 I meant to post this Day 2 post earlier but things kinda got lost in the shuffle….. 🙁 Anyway, here is Day 2 of my sister’s visit to Jeju Island describing her visit to the best seafood restaurant in Jeju Island. Day 1 was Pork. Day 2 is Seafood! 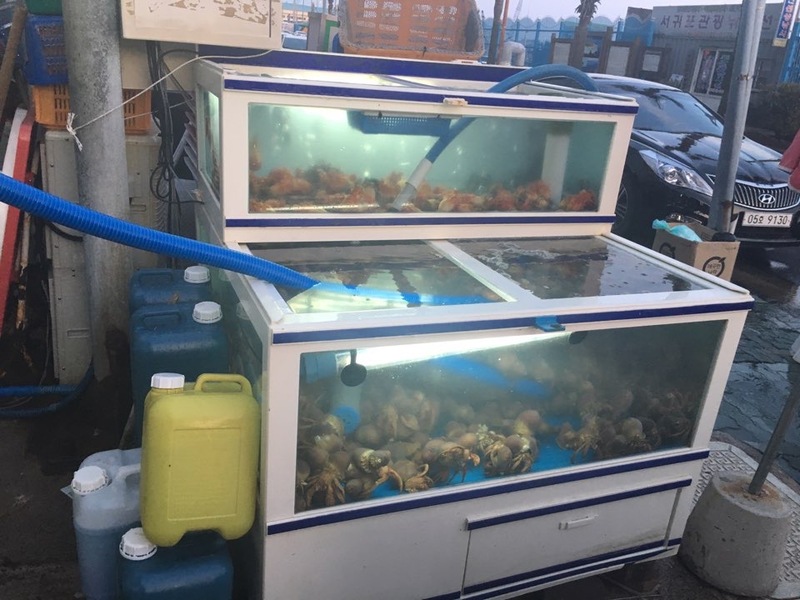 As you can imagine, Jeju island is famous for its fresh seafood. 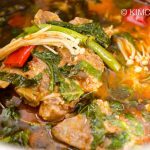 If you missed my earlier post, read Flavors of Jeju Island – Day 1 if you want to know more about Jeju Island and Jeju pork. Ok, the following is brought to you by my sister #3, again. 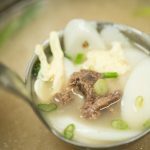 Thank you sis, I know you are a very busy woman and I really appreciate you taking pics and writing this wonderful piece about this Jeju Island restaurant. After the carnivorous feast the previous day, the natural choice was seafood. So the husband again took us to the “Budu Hoet Jip” 부두 횟집 (translation: raw fish house by the docks). There was an error with our reservation so we ended up waiting for about 30 minutes. I took advantage of this time to take photos of the fish tanks outside the restaurant. 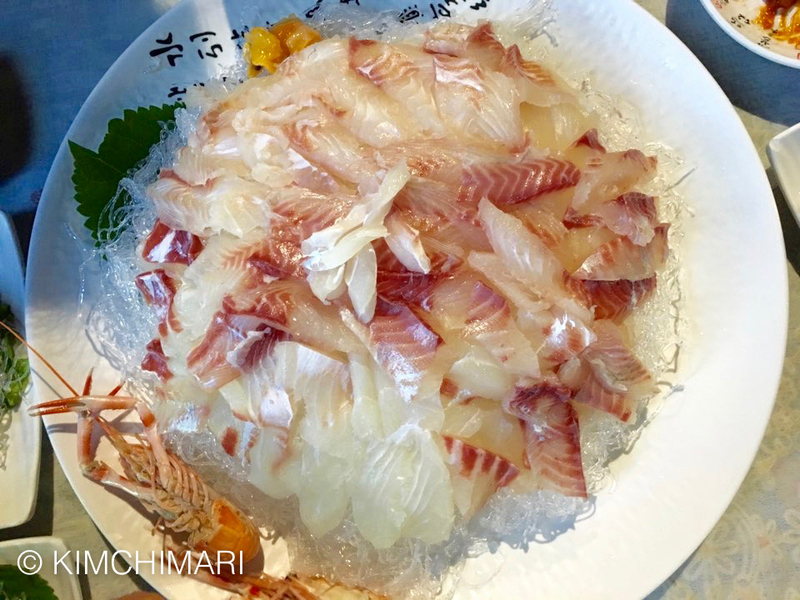 The photos are those of live abalone, ocean eel, fish, and sea squirt. 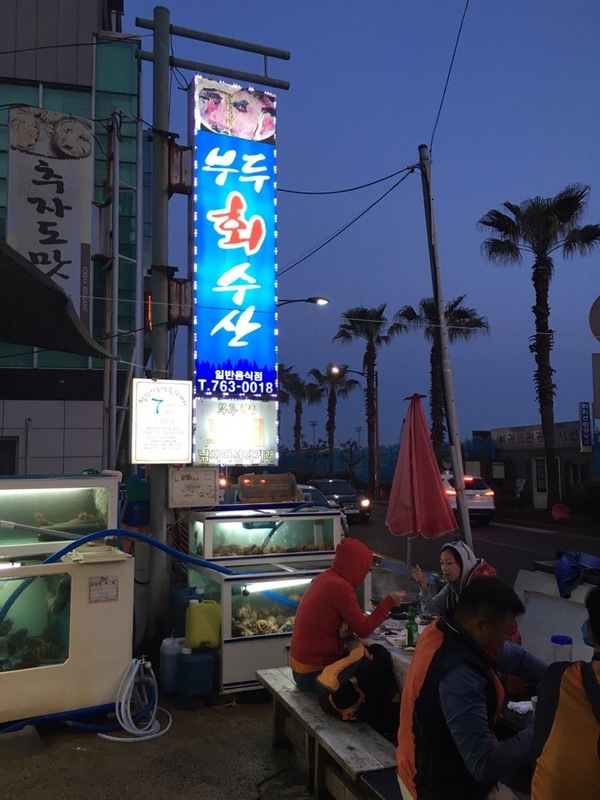 A popular fresh seafood that’s served raw at many sea side towns in Korea is a particular variety of octopus called Nakji (낙지 octopus vulgaris). It’s small in size and habitats tidal mudflats. So they’re not fished but plucked out of the mud during low tide. 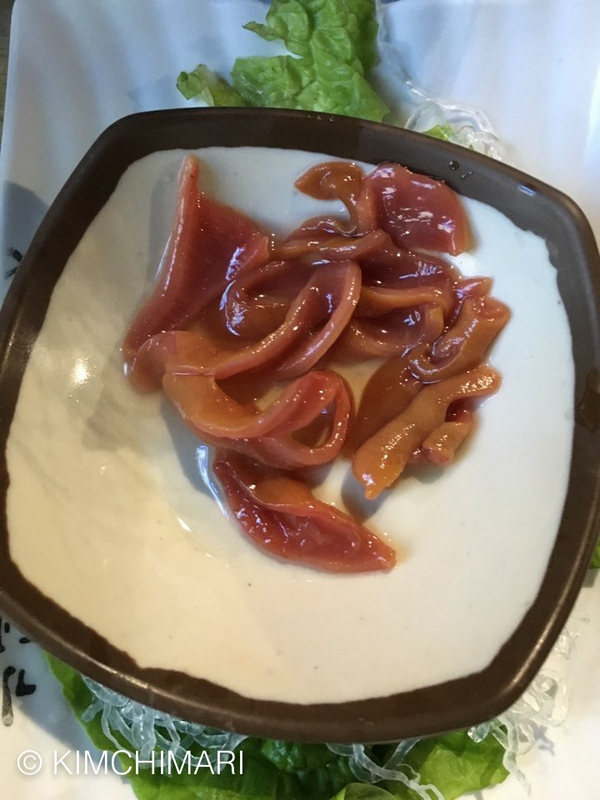 When eaten as a hoe (회 raw fish), it’s cut up while still alive, and we call this sannakji (산낙지) which means “live octopus.” When served, the pieces still move on the plate. I think it’s a rather barbaric way of eating octopus, but there are sannakji fanatics who claim it’s a test of true gourmets. One thing caught my eye. Two empty boxes of French wine sitting outside the joint. It’s certainly not on the menu. I guess the owner didn’t know how to spend all the money he was making. After the long wait, we were finally seated at the outside table and ordered the set menu. There was nothing to choose. The menu is decided by the catch of the day. Customers just choose the total price of the meal – 150,000won, 200,000won, etc., depending on the number of diners. 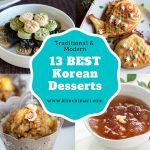 They first brought out small plates of appetizers consisting of raw abalone, sea cucumber, octopus, squid, belt-fish, mackerel, etc. There were so many I had to take three separate photos. 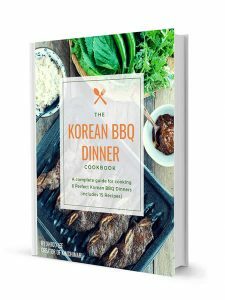 Koreans harvest and eat almost everything from the ocean. 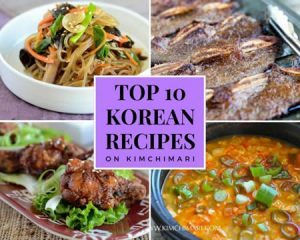 We are particularly fond of slimy and gooey things like squid and seaweed. 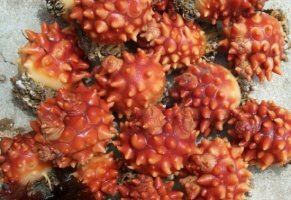 One very popular slimy fellow is the monggae 멍게 (sea pineapple or sea squirt). Monggae looks like those rubber balls with spikes sold in pet stores. But we only eat the soft inside. It is, yes, very slimy and also quite bitter. 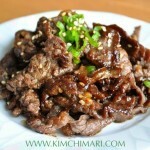 But the bitterness turns into something wonderful when combined with sweet and spicy gochujang. There was also gaebul(marine spoon worm) on the table, so I tasted it for the first time in my life. 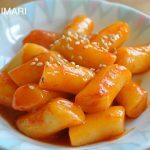 Gaebul has a muddy color and a taste that’s non-descript, but it was palatable when dipped in cho–gochujang. 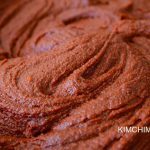 Cho-gochujang is chili bean paste mixed with vinegar and sugar. 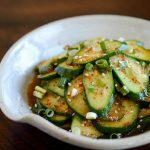 It’s similar to wasabi-soy sauce or cocktail sauce in principle, and makes anything from the ocean taste good. Of all the appetizers, my favorites were the raw abalone and sea cucumber. Thinly sliced, very hard to chew, but divine in flavor. The best thing about eating seafood near the ocean is that you’re getting the real thing. 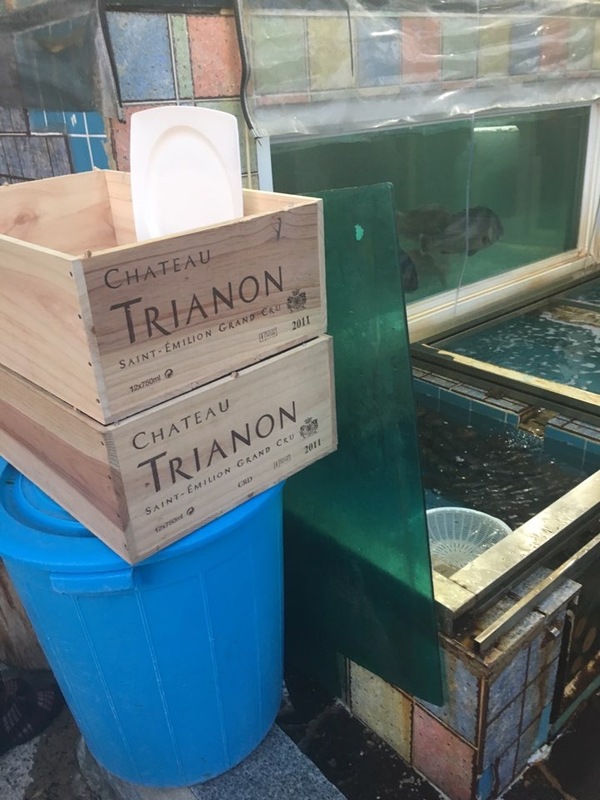 Most restaurants or markets in Seoul will sell farmed seafood. There’s a huge difference in flavor. After a while, the big plate with a mound of sliced raw fish was finally served. Ordinarily, raw fish is served thinly sliced and spread flat on the plate, but not this one. I could hear an “Ahhh! !” sound at every table when this small hill of raw fish appeared. The fish was a type of dom 돔 (sea bream). 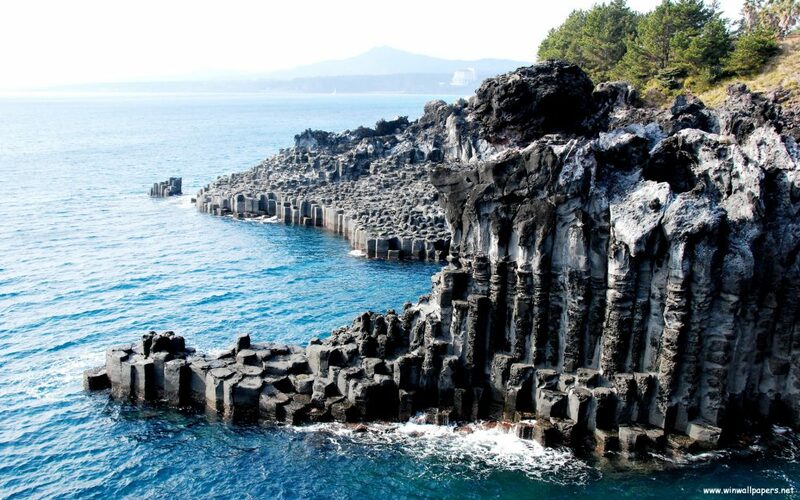 There are about ten different varieties of doms in Jeju, but non-locals really can’t tell. All I can say is that it was super, super fresh. There’s a slight elasticity to raw fish when it’s this fresh. 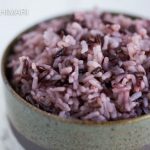 It’s completely different from the sashimi served in urban Japanese restaurants, which usually come from frozen blocks of fish. By this time, it was late and the ocean breeze had turned cold. 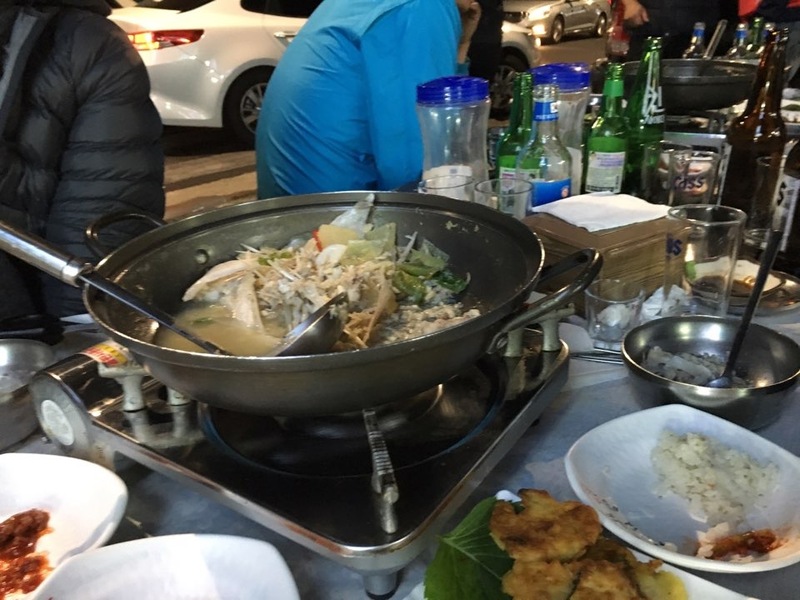 So we were very happy when the last course was served: clear fish jjigae(stew) made from fish bone and head and served boiling on the table-top stove. It was the perfect ending to a glorious seaside feast. 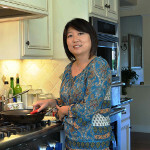 Fish head is an invaluable part of the fish and makes the best tasting broth. There should be a law prohibiting supermarkets from cutting the fish heads off. Anyhow I was so eager to warm my body that I forgot to take a photo until the fish soup was half gone. Sorry, Jinjoo. I’ll try to get a better photo next year. Ciao! I am so jealous ! 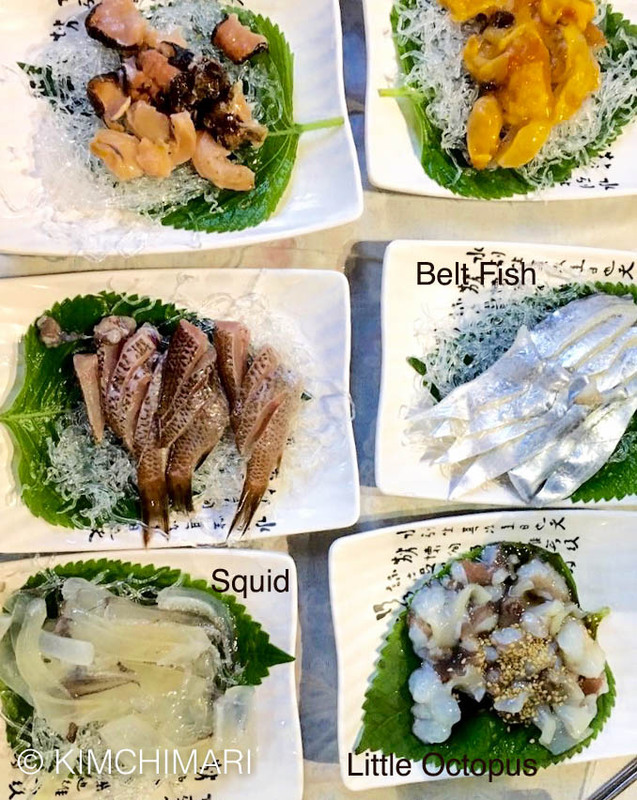 I was living close to Uljin, 120 km north of Po Hang 30 years ago, and would go to the sashimi restaurants once a week, at least, There is so much variety there. And yes, one of my preferred one were the Sea Cucumbers too ! And we would end up with the Meun Tang cooked with the fishes bones, Soy sprouts and tofu. A feast everytime !